by John M. Zelle, Ph.D. 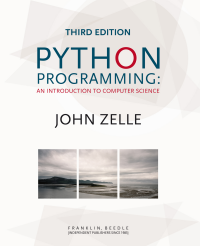 I have written an introductory CS textbook using Python. It is published by Franklin, Beedle & Associates. If you are interested in reviewing or adopting this textbook, contact Tom Sumner at FBA. Instructor resources including problem solutions and exam questions are available from the publisher. Click an edition below to access edition-specific public resources. I have developed an easy-to-use graphics library to introduce object-oriented concepts. The library is released under the GPL, so it is freely available for use and modification. graphics.py The simple graphics module used in textbook examples. This is version 5.0, and will work with both Python 2.x and 3.x. This is the latest version of the graphics library can be used with any edition of the book. It is known to work under Linux, Windows, and Mac OSX. 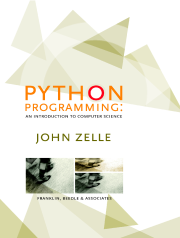 At Wartburg College we have been using Python extensively in our curriculum since 1998. We have found it to be a near-ideal first language and a useful tool throughout the curriculum. I am convinced from my experiences that Python is a much better for teaching than languages such as Java, C++, or Ada. If you are interested in learning why, check out some of my papers and presentations. Paper presented at 13th Annual Midwest Computer Conference, March 1999. 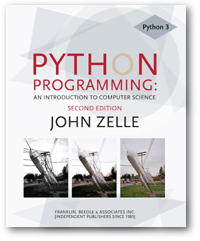 This position paper presents the case for Python in CS1 and CS2 courses. Belorussian translation by Alyona Sinkovich. HTML version of a talk I presented at CS & IT 2008 a symposium sponsored by CSTA and ACM. HTML version of a workshop I presented at SIGCSE 2004. sigcse-slides.pdf is a PDF file of the slides, and sigcse-handout.pdf is a handout with 4 slides per page. HTML version of a talk I presented at CCSC Fall 2003. ccsc-slides.pdf is a PDF file of the slides, and ccsc-handout.pdf is a handout with 4 slides per page.